Far North Queensland. It’s on most overlanders bucket lists thanks to its huge number of amazing destinations. And it has a little something for every one of us with a tow tug to enjoy. You can follow in the steps of the early explorers, visit historic towns, view amazing wildlife like Palm Cockatoos and Tree Kangaroos, and explore remote savannah, rainforests and the Great Barrier Reef. 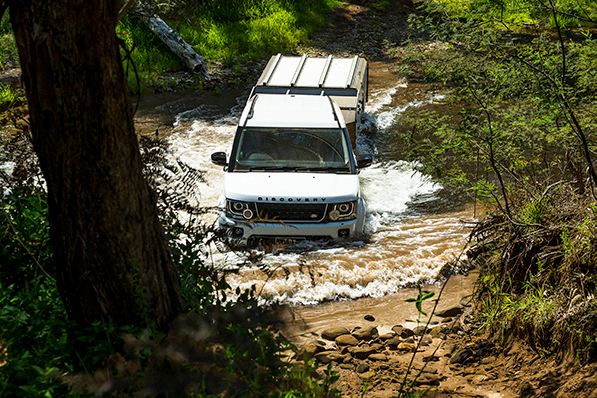 Not to mention its great fishing, 4WDriving and what we all love – bush camping. However, we should remember that the northernmost tip of our beautiful country is far closer to Port Moresby than it is to Cairns – and that most of us live much further south than this Queensland tourist locality. Indeed, 35 per cent of Australians live in either Sydney or Melbourne, and a staggering 80 per cent of the population live along the narrow strip of coast between Brisbane and Adelaide (you should check out the census data; it’s an eye opener). From Melbourne, it’s 4,000 kilometres one way to the Tip, which amounts to at least 60 hours of driving via the most direct routes. And that means you’re probably looking at a week on the road simply heading north (if you’re being reasonable and responsible, abiding by the speed limit, and aiming for eight hours on the road each day). From Sydney, deduct a day and then subtract another day if you’re leaving from Brisbane. But any way you look at it, a trip to the Tip will likely involve a long haul, even before you’re within a coo’ey of Cape York. For us, planning a trip to the Far North means working out which of the multiple iconic tracks we plan to tackle once we venture beyond Karumba or Cooktown. Prior to that, we have thousands of kilometres to safely navigate before the adventure truly begins. And that means knowing where our stopovers are en route and making the most of them. Leave this part of your trip to chance and you may jeopardise the safety and enjoyment of yourself and your crew. None of us want to join the 1,200 people in the nation’s cemeteries who die on the roads annually. With this in mind, we thought we’d share with you some of our favourite ‘Stop, Revive, Survive’ sites when we’re heading north. Visiting these sites requires that we open our blinkers – just a little – beyond simply charging along the main arterial roads north. But, for our money, the small detours are well worth the effort to help us snap out of a single-minded and dogged pursuit of the northernmost point of Australia. Depending on where you live and the route you chose, you may wish to check out bushranger Captain Thunderbolt’s Rock, hide-out and grave whilst you’re trundling along Thunderbolt’s Way – NSW tourist route 21 and A15. This stop could be a driver reviver or an overnighter. Heading towards Uralla from the south you will see a large rock outcrop next to the highway. It’s known as Thunderbolt’s Rock. For Frederick Wordsworth Ward, better known as Captain Thunderbolt (a notorious Australian Bushranger), it was the perfect vantage point for monitoring the approach of unwary mail coaches. Police shot Captain Thunderbolt in 1870. You can visit his grave site in Uralla. Further up the road, 12km from Tenterfield on Mt Lindsay Highway and about 300m up a walking track, there’s another rock outcrop where this ‘gentleman’ bushranger lied up in the 1860s. He used the spacious area between the rocks to stable his horses and the small shelter under the large rock as a place to camp. The top of the rock made an ideal lookout, to observe the main road during the gold mining days. Believe it or not, right next to this second outcrop is some more modern history. Most people think of the WW2 ‘Brisbane Line’ as a single defensive strip from Brisbane – and yet, right here in Tenterfield, next to Thunderbolt’s hide-out, the Aussies laid tank traps and explosives under the road as a cratering device to stop the potential Japanese advance. Rotary Park in Uralla itself is a great place to stop and stretch the legs and catch a break. It’s got a big turning circle, 24 hour toilets, water and picnic tables. Those south of Sydney will most likely take the inland route. If you do, try to stop at Temora during a weekend on the way up or the way back. Then you can check into the Temora Airfield Tourist Park Caravans and Camping, next door to the Temora Aviation Museum. The museum offers a very unique experience, whether a flying day or non-flying day. Situated on a WW2 training airfield, the museum conducts flying displays on select weekends called Aircraft Showcases. They’re worth looking into, particularly if you don’t get up this way much. The showcases deliver a full day of entertainment for all ages, where you can witness Australia’s ex-military flying history come alive in the sky. Where else can you see the legendary Spitfire bolt through the blue, dispersing clouds? Or perhaps the little pilot in you might prefer to see a Tiger Moth, Meteor, Wirraway or a Boomerang? Situated approximately 10 kilometres north of Childers on the A1, three and a half hours out of Brisbane, the amenities at Lake Redbrook Holiday Retreat are a sight for a driver’s sore eyes. What makes this place different from its competitors is that it’s situated on 165 acres of working sugar cane farm, a great slab of which comprises a well-stocked lake and associated dams where guests are invited to wet a line in pursuit of some nice looking saratoga or bass. Perhaps this is a good chance to whip out – and test out – your fishing gear before hitting the Far North? Kayaking is also an option and there are well-marked walking tracks. The kids will love the deer in the back paddock, the farm animals and the small swimming pool. And guests can pick fruit to eat while meandering through the property’s heritage orchard. If you’d like to sample an obscure selection – including star fruit, chocolate pudding fruit, soursop, sapodilla or ice cream bean – you may be in luck, provided the fruits are in season. The retreat has one of the best (and cleanest) camp kitchens we’ve seen in a long time. Guests are free to use the white goods, pans and kettles. And with word to the owner, you can even crank up the pizza oven or the spit roast! Ferns Hideaway Resort at Byfield, 40km north of Yeppoon, is a secluded, family-owned and operated, colonial-style resort and caravan park. What makes this place unique is the onsite restaurant with its live entertainment on weekends, hosted by the resident musician Marto and friends, who play requests from the 60s, 70s and onwards. Be prepared to be surprised by this atmospheric funky place, with its licensed bar and à la carte menu. When you’re done, you can take a short walk back to your camper where it’s parked on the site’s grassy campsite. And as the sun comes up, you’ll find an abundance of friendly wildlife and canoes by the river that guests are free to use. For those with time to spend an extra day, the trip to Great Keppel Island with Freedom Fast Cats offers an affordable opportunity to experience a little of the reef, close to shore, with an enthusiastic and welcoming crew. Great Keppel Island’s heyday was clearly back in the 80s when its main resort played host to a stream of contestants from Grundy’s Perfect Match dating show. Today the crowds have gone and the big hotel is closed. But the beaches are just as sandy white as they always were – and probably a lot cleaner. So, you’ve reached Townsville and you can almost smell the Gulf country. Well, it might be time to ask yourself: when is the next time you’re likely to get up this way? If the answer’s ‘not any time soon’, consider heading north-west out of Townsville on the excellent Hervey Range Road, making a beeline for Undara Volcanic National Park. If you’re ‘doing the Gulf’ from Normanton, Undara is right on track. If you’re aiming for Cooktown to step off, you’ll add 350km to your overall trek north, but you’ll enrich your knowledge about Australia’s tumultuous geological beginnings. At Undara Volcanic National Park, you’ll see what happened 190,000 years ago, when a volcano blew its top to create one of the earth’s longest flows of lava originating from a single volcanic event. Walking in the lava tubes and walking around the Kalkani Crater rim gives a perspective on what was happening in Australia when homo sapiens first walked the earth in Africa. You know a place like this is worth visiting when you find out that David Attenborough and Tim Flannery rate it. While Undara Volcanic National Park is open to day visitors, and the rim walk is free, camping opportunities and the lava tubes themselves are in private hands – managed by the descendants of the first white settlers in the area in the 1860s. Depending on where you’re leaving from you may wish to design your route around the Big Things of Australia. This forms the nutshell of many Aussie’s trips! There is estimated to be 150 or more of such objects around the country, with representations in every state and territory. The pioneering big thing came in 1963 in the form of the Big Scotsman in Medindie, Adelaide. Since then most have been designed as tourist traps along main roads, with the intention of making you stop. As such, they have coffee shops, local fruit and veg, and are purpose-built for driver reviver stops – and hence perfect for the long drive to the Tip. The calls from the back seat of “are we there yet?” reduce in frequency when the route is dotted with attractions kids love – including but not limited to the Big Orange, Big Cod, Big Merino, Big Guitar, Big Banana, Big Prawn, Big Pineapple, Big Mango and Big Gumboot.